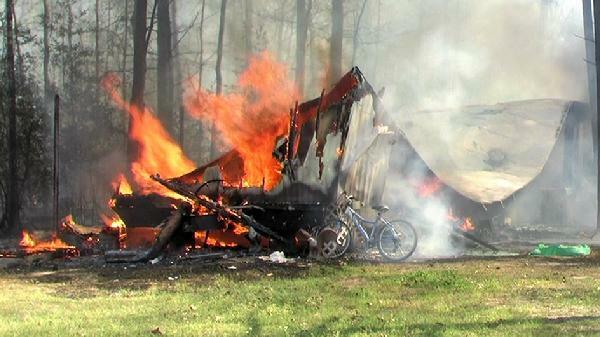 When we arrived, the roof had collapsed and the mobile home was totaled. Fire Totals Mobile Home, SCENIC LOOP, March 14, 2013 - At approximately 3 pm on March 13, 2013, a fire was reported to the Polk County Sheriff's Office. Firemen from the Scenic Loop Volunteer Fire Department arrived at 317 Willow Bend in the subdivision of Lake Livingtston Village to find a mobile home engulfed in flames. Scenic Loop VFD was quickly backed up by Livingston Volunteer Fire Department. The mobile home was owned by Tammy Ayers. The Mobile home was destroyed. Deputy Mark Dubose with the Polk County Sheriff's Office was dispatched to begin an investigation. Ayers reportedly lived in the mobile home with her daughter. She did have insurance. Fortunately, nobody was injured in the fire. The cause of the fire remains under investigation. If you would like to comment on this story, we'd love to hear from you. Be sure to specift which story. Your name will be posted with your comment in Letter to the Editor.